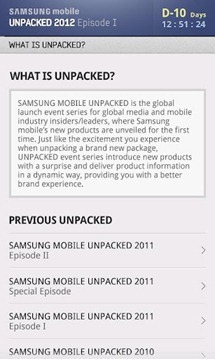 Samsung Mobile, as part of what has certainly been an epic lead-up to a new flagship so far, released an official Unpacked 2012 companion app to Google's Play Store today, bringing some awesome functionality both to those lucky enough to attend the event and everyone else. One of the most impressive features of the app is that it allows users to watch the event in real time. 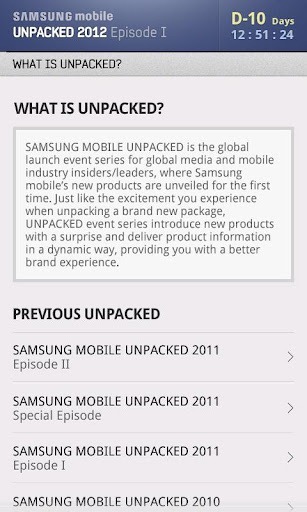 This means users can watch the unveiling of the "Next Galaxy" live no matter where they are. 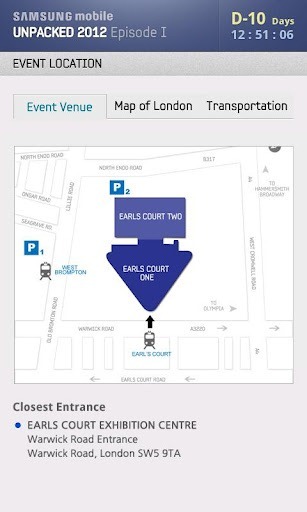 The app will also show the new product's details, an official press release, and give helpful venue and transportation maps, as well as a map of London. The app also features an excruciating count-down timer in the corner, but those anxious for the event can check out the app's description of past Unpacked events in the meantime. If you haven't already, grab the app from the widget below and prepare to meet the next Galaxy…in about a week and a half.